Afghan troops being trained by NATO at one of the military training centres in Kabul. 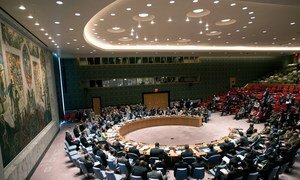 Amid ongoing violence in Afghanistan, the United Nations Security Council today welcomed the agreement between the North Atlantic Treaty Organization (NATO) and the Afghan Government to establish a new non-combat, training, advisory and assistance mission, which would begin operation in January 2015. Unanimously adopting a new resolution the Council underscored the importance of continued international support for the stabilization of the situation in Afghanistan and of further enhancing the capabilities of and capacities of the Afghan National Defence and Security Services and the NATO entity, to be called the Resolute Support Mission, will train, advise and assist the Afghan National Defence and Security Forces. The Afghan forces still have capability gaps and development shortfalls, especially in the Air Force. Equipment procurement, financial management and accountability procedures need to improve. Endemic corruption persists. Further progress is required in the participation of women in security Institutions and forces, in securing women’s rights, and in the protection of children in armed conflict, especially in eliminating the recruitment of child soldiers, says the letter. The work of the Resolute Support Mission would be focused at the institutional level in Kabul, but also provide continued advice to the Afghan forces at the corps level in the regions. The Council also looked forward to the leadership of the Mission working with the Afghan Government and in close coordination and cooperation, where relevant, with the UN Assistance Mission in Afghanistan (UNAMA) and the Special Representative of the Secretary-General for Afghanistan. The resolution comes the day after the Council condemned in the strongest terms Thursday’s suicide attack at the French Institute of Afghanistan in Kabul, for which the Taliban claimed responsibility. Reiterating the fact that no terrorist attack can reverse the path towards Afghan-led peace, democracy and stability in Afghanistan, the United Nations Security Council issued a statement, read by the President, which reaffirmed the need and reiterated their determination to combat threats to international peace and security caused by terrorist acts by all means, in accordance with the UN Charter and international law. The United Nations Security Council has condemned in the strongest terms the attack yesterday on a United Kingdom embassy vehicle in Kabul, Afghanistan, reiterating serious concern at the threats posed by the Taliban, Al-Qaida and other terrorist and extremist groups.